I was back in Ipoh last week to visit Jo and her family which meant it was that time of the year again to quell my cravings for Ipoh’s regional street food specialities. Until my maiden visit last year, I had never actually spent proper time in Ipoh before and hence never knew all the great hawker food I’ve been missing out on. Here is a round up of Old town’s best. Not much about Nam Heong has changed in the many years it has been open. The place still has that old world feel about it and has been serving up some of the country’s finest local coffee long before Starbucks took over our streets. 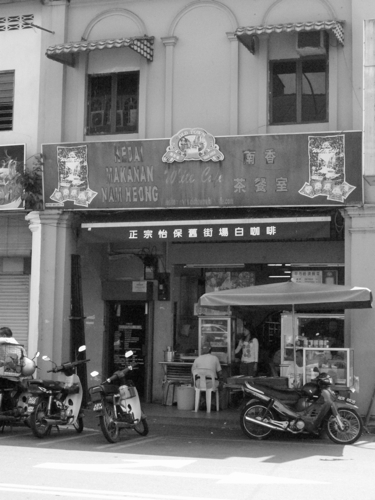 Birthplace of the original Ipoh White Coffee, I get the sense that Ipoh-ians still hold Nam Heong in very high regard with a sense of pride that puts this institution on a pedestal above the more commercialised franchises such as Old Town and Papparich which have since exploded across the country. The Iced White Coffee we ordered, though a little too sweet for my everyday consumption, was as you would expect – bold, aromatic and creamy. A caffeine-fix and a half that is bound to kickstart the engines of all of you who need that double shot of espresso to get going in the morning. 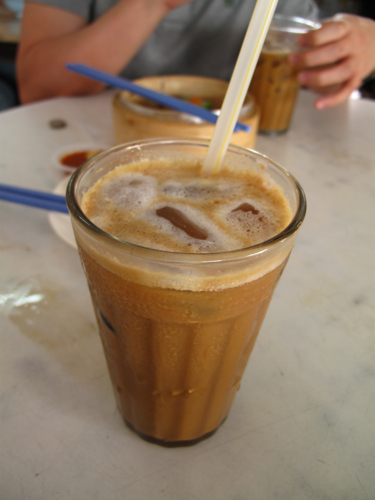 Coffee aside, what is also worth a mention are the supporting hawker acts which include everything from the Ipoh speciality noodle soup Hor Hee to Curry Mee. When we last visited however, it was still very much breakfast time, so to avoid the risk of a food K.O too early in the day, we shared a couple light Dim Sum bites from one of the newer looking stall operators. Although juicy and meaty, the Siu Mai which we called wasn’t very memorable at all. The jade green skin was clumsily thick which seemed to point to the ever growing, factory mass-production-esque nature of Dim Sum these days. What was particularly good however was the Char Siu Sou – the crisp, flaky, yet melt in the mouth pastry was delectable as was the sweet barbecued pork filling. As good if not better than what you get in any high-end dim-sum restaurant. This old-school coffee shop just down the road from Nam Heong is without a doubt my favourite hawker food joint in Old Town. 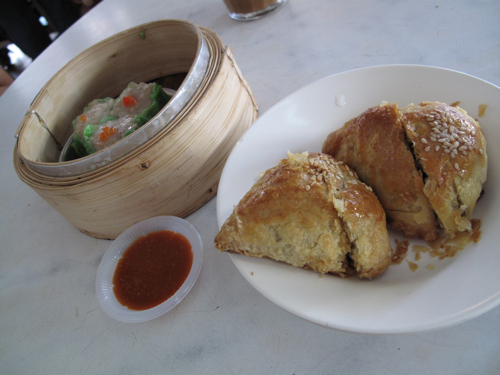 The Ipoh Kuey Teow and po-piah are must-haves that I quite simply won’t leave Ipoh without. Also popular are the Satay, and home-made Creme Caramels they do here. My mom tells me its something to do with the water in Ipoh which gives the rice noodles, beancurd and fishpaste here their ultrasoft, velvety texture. Magical water or not, this really is the smoothest Kuey Teow money can buy. 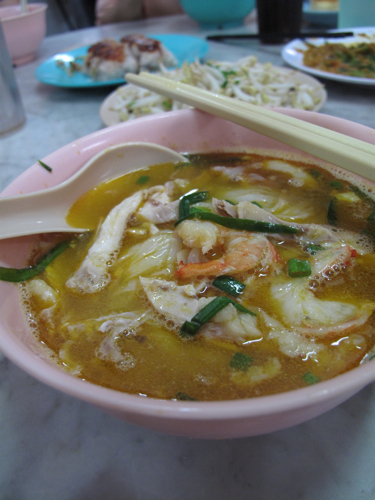 Add to that the characteristic sweet, yellowish-red broth that is fully loaded with chicken and shrimp and what you have is the finest example of Ipoh’s national dish. Divine, especially when eaten with a side-serving of their crunchy beansprouts. The po-piah stall here does things just the way I like it… the turnip filling, sweet and moist but not overcooked, still with a soft ‘bite’ to it. The generous dousing of chilli sauce and sprinkling of deep-fried shallots finish the dish off perfectly. Yum-meh. I’m told that Lou Wong has become increasingly touristey over the years with patrons arriving by the bus-load. 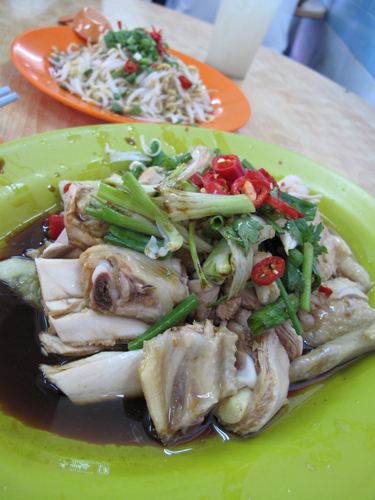 But people really do come here from all over all walks of life to eat one thing, and one thing alone – Ngar Choi Kai (Steamed Chicken with Beansprouts), another Ipoh speciality. 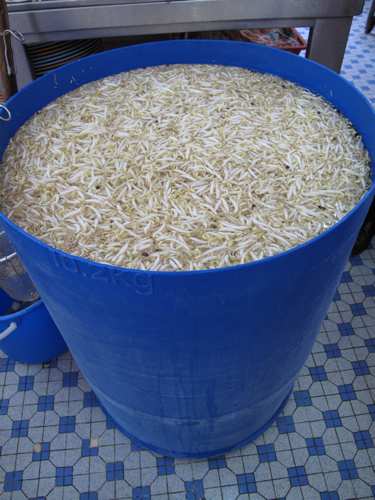 Judging from the enourmous water tankards where beansprouts are being soaked and the number of tables which spillover onto the streets during dinner time, its grown into a pretty major operation. 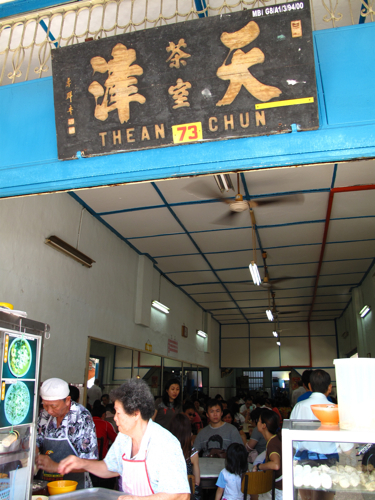 It’s hard to describe what makes Lou Wong’s chicken better than any other Chicken rice stall. For me, its a combination of the moistness of the meat, together with the depth of flavour from their soya-sauce which I suspect has been sweetened by some sort of secret home-made chicken broth concentrate. The beansprouts are also extremely fresh and plump, without that raw grass-like taste which you often get from sprouts that are stale or not plucked with care. 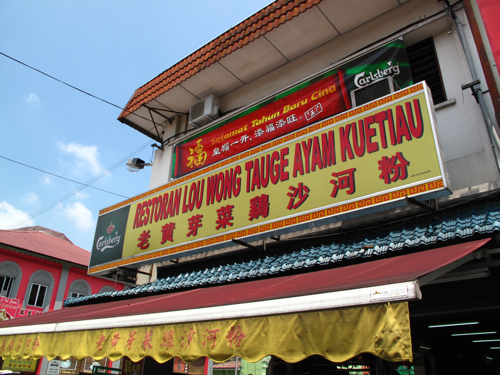 Unfortunately, I wasn’t in Ipoh long enough this time around to cram Lou Wong in for lunch. As consolation, I did however carry 2 whole chickens and a large portion of their beansprouts all the way back from Ipoh to KL for supper =P. No, I’m not crazy. Sigh… a few days on and I’m missing the food already. Ipoh, I bid you adieu… I’ll be back next year. p.s. Special thanks must go to Jo & family who have been the most awesome of foodie tour-guides. ooh! lou wong ngar choi kai! that reminds me so much of my childhood… my family used to go there all the time!